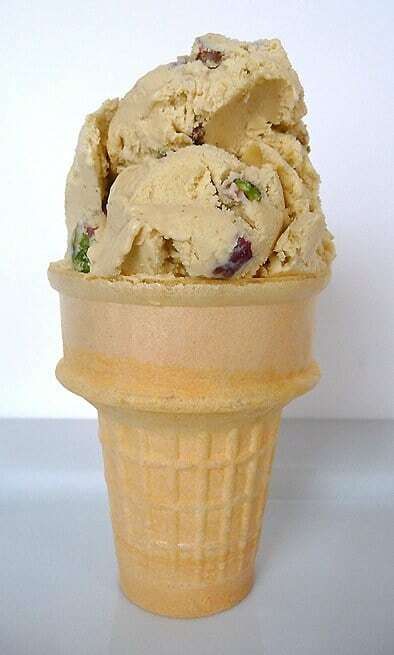 In the interest of full disclosure, I am sharing the whole story about how this pistachio ice cream came to be. Developing this ice cream recipe has been a couple months in the making. Back when I made the pistachio gelato that kicked off National Ice Cream Month in July my Chief Culinary Consultant tasted it and wasn’t really blown away. And since he is always 100% honest in his reviews of my concoctions (which I totally love since I know when something is REALLY good or still needs work), I know if he tells me my pistachio gelato needs an overhaul to become great pistachio ice cream, I need to head back to the kitchen with my mad scientist cap on. Since pistachio is one of his favorite ice cream flavors, I set out to perfect homemade pistachio ice cream. I should note that some other people did try the pistachio gelato and liked it. 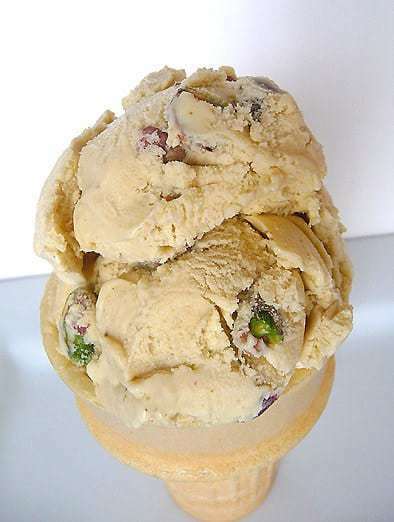 It doesn’t have the same consistency as ice cream and is chock full of finely chopped pistachios so it is different than store-bought pistachio ice cream, so you can use your own judgment based on your personal preferences to determine which you’d like to try. Or try both and come back and let me know what you thought! #1: Lots of little chunks of nuts = no good. I needed to get the pistachio flavor in the ice cream without all the ground up nuts in order to preserve a creamy ice cream consistency. #2: Egg yolks. I knew that using egg yolks as the base of my custard would greatly enhance the texture of the ice cream. #3: But where are the nuts? Even though I wanted to get rid of the ground nuts we still needed nuts in the recipe because, well, it’s pistachio nut ice cream. Okay, so here’s how it all came together. I started reading cookbooks and looking at recipes online, even though I knew I wouldn’t use any of them in their entirety. I was looking for how the flavor was developed, and how ingredients and methods were used. I remembered back when I made vanilla ice cream, that the vanilla bean and seeds were steeped in the milk and cream to extract a lot of the flavor. Bingo! 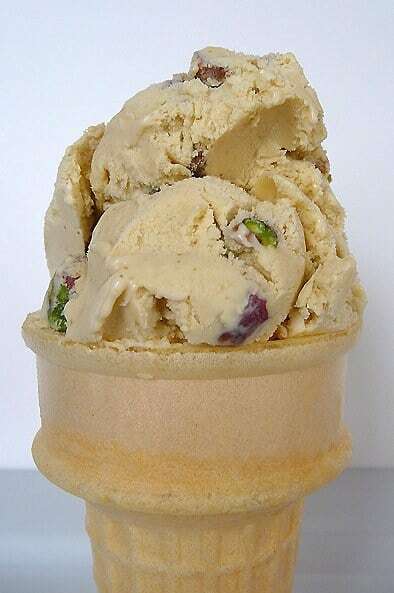 I still ground up the pistachios, but then steeped them in the hot milk/cream mixture, and then strained them out so that all of the flavor remained, but the ice cream wasn’t full of ground pistachio chunks. I basically proceeded with the rest of the recipe has I had with the vanilla, adjusting the flavors slightly and then folding in coarsely chopped pistachios at the end. I am happy to report that I developed a winner. I used this ice cream as the pistachio layer in my Italian spumoni, which also got rave reviews from everyone who tasted it. 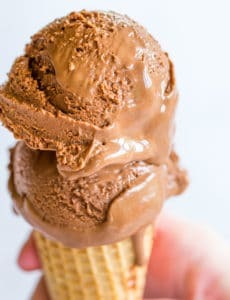 This homemade ice cream is to good not to try! 1. Grind the 1 1/3 cups of pistachios in a food processor until finely ground, but not to a paste. Set aside. 2. In a medium saucepan, warm the milk, sugar, 1 cup of the cream, and salt, stirring to dissolve the sugar. Stir in the ground nuts. Cover, remove from the heat, and let steep for at least 30 minutes. 3. Strain the warm nut mixture, pressing on the nuts to extract as much liquid as possible, and discard the solids. Return the milk and cream mixture to the saucepan. Pour the remaining 1 cup cream into a large bowl and set a mesh strainer on top. In a separate medium bowl, whisk together the egg yolks. Slowly pour the warm mixture into the egg yolks, whisking constantly, then scrape the warmed egg yolks back into the saucepan. 4. Stir the mixture constantly over medium heat with a heatproof spatula, scraping the bottom as you stir, until the mixture thickens and coats the spatula. Pour the custard through the strainer and stir it into the cream. Add the vanilla extract and almond extract and stir until combined. 5. Refrigerate until cold. Pour into an ice cream maker and freeze according to the manufacturer’s directions. Once finished churning, fold in the ¾ cup pistachios with a rubber spatula. **You’ll notice this pistachio isn’t bright green like you find in stores. I didn’t use any food coloring, so this is all natural, but you can add a couple drops of green food coloring if you’re looking for a deeper green shade. My 87-year-old mother has been asking for pistachio ice cream and of course you were one of the first sites I headed to. Only problem is I have a 1 quart Krups ice cream maker. Do you think your recipe would work if I cut the recipe to two thirds? Do you use raw pistachios or toasted? Hi Sunny, I used roasted/salted. I made this for my husband for his birthday and it was a HIT! He is very discerning and can be hard to please, but he went CRAZY for this ice cream. He was actually sad I served it at his party because everyone loved it and it was almost gone after (and was gone by breakfast the next day!). His father requested it for his birthday a week later.I’m actually making it for my husband again for Christmas (we’re doing homemade gifts this year) and I know he’s going to be so excited b/c he keeps asking me when I’m going to make it again. Worth noting though – shelling that many pistachios does a number on your fingers. OUCH! I just wanted to say ‘thank you’ for all the hard work in getting this recipe together years ago. 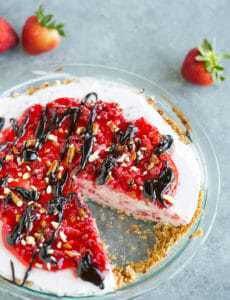 This is actually the recipe that helped me find your wonderful site back in ’09, and you’ve always been the source of me making these wonderful treats for wonderful memories. Just being thankful, and I hope you’re here always with us. I was just wondering what I can do with the leftover marinated pistachios. Someone mentioned you can make tart filling with it. Can I made pistachio pesto sauce with it? Hi Janice, You could definitely try making the pesto! Have you made this with caramel added in? Hi Aggie, I have not. I ordered some raw organic pistachios , very expensive. while i was making this i googled recipes for egg whites, and I had just picked Blueberries. A recipes came up from Australia, called a friand. Like a muffin, but made with almond flour and egg whites. I thought that I didn’t have almond flour, but had ground pistachios. So made the recipe with pistachios left over and egg whites, it was OUT OF THIS WORLD DELICIOUS! was able to use 2 byproducts from this ice cream. PLUS PLUS! I recently bought an ice cream maker and have been trying different recipes. This was wonderful and creamy with an excellent rich pistachio flavour. Like a previous poster I was loathe to discard the ground pistachios. I found a good recipe for pistachio muffins on http://scarlettabakes.com/pistachio-muffins/ and used 3/4C of the leftover ground pistachios as well I used one cup each of brown and white sugar rather than 2C white. 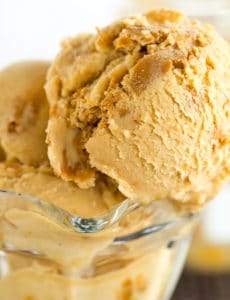 Thanks for all the research to develop such a great ice cream recipe.